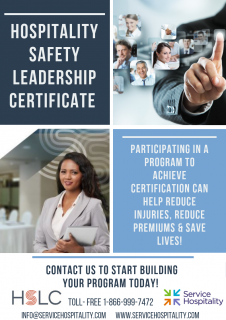 Participating in a program to achieve certification can help reduce injuries, reduce premiums and save lives. Contact us to start building your program today! Exclusive to the hospitality industry, the Hospitality Safety Leadership Certificate is designed to lead you (the employer) through the process of developing and implementing a health and safety management system, and to empower you to create a system and a corporate safety culture that will improve the way you do business! Even if you aren’t in the hospitality industry this program is available as a Health & Safety Leadership Certificate as well! Requirements for each level build on the foundations of the previous levels, as you progress through the development of the program, you will achieve increased recognition and improved health and safety processes. Start the development of an effective OHS system by establishing management’s commitment to the process and taking a baseline measure of the organization’s health and safety culture. Current General Manager (Senior Manager) completes the Health & Safety Leadership* training (7 hours). The organization completes a Safety Evaluation or Perception Survey with the participation of a minimum of 50% of employees. Build the foundation of an OHS system by conducting the organization’s hazard assessments and identifying staff training needs. Key employee(s) complete Qualifications, Orientation & Training (3.5 hours). The organization’s formal hazard assessments have been completed within the last year or reviewed within the last year. The organization has completed a Safety Evaluation or Perception Survey within the past 3 years. Take the training needed to develop the systems required to control for the workplace hazards identified and maintain a health and safety management system for the organization. Take the final step and conduct a Health & Safety Audit. The organization successfully completes a Health & Safety Audit. *The current most senior manager must have completed the Health & Safety Leadership training at all levels of certification. The intent of this seminar is to expose senior management to training that will explain the importance of health and safety to their business. It is designed to ensure senior managers understand their responsibilities for the safety of their workers, the repercussions of not meeting these responsibilities, and the basic systems they must implement. ** For all Level 2 & Level 3 training programs, key staff are required to attend. This includes those who will be overseeing and/or carrying out the relevant function. For example, for Workplace Inspections, those responsible for Inspections must complete the training.